These articles are scanned and OCRed from old editions of the National Radio News magazine. Here is a list of the National Radio News articles I have already posted. All copyrights are hereby acknowledged. 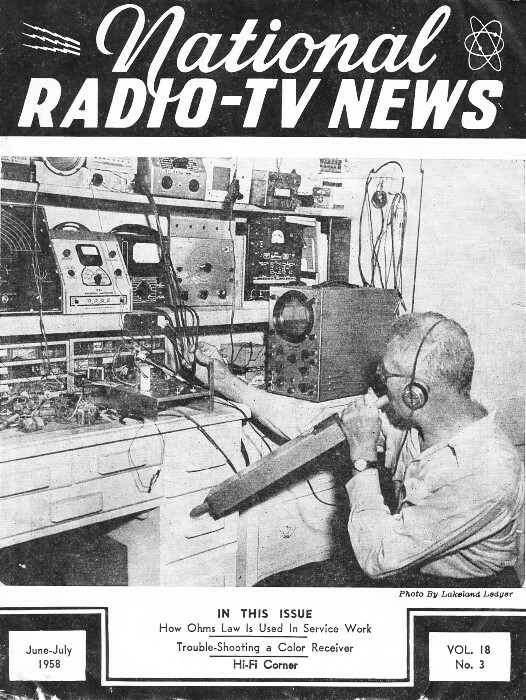 Cover photo for this issue shows Graduate Arthur Stopes of Auburndale, Florida, at work in his home laboratory. Mr. Stopes, a representative of the Wicks Organ Company, honorary charter member of the American Academy of Organ and member of our own Alumni Association makes his living and hobby servicing, installing, and selling electronic as well as pipe organs. He is now working experimentally toward creation of a new electronic organ and is shown blowing into an organ pipe and checking the wave pattern on his scope. Mr. Stopes uses this precise method to produce "carbon copies" of an original tone.